Home / Stick Welder / Miller CST 280 Stick Welder (907251011) Made in the USA! Miller CST 280 Stick Welder (907251011) Made in the USA! The Miller CST™ 280 is a durable yet lightweight Stick/TIG welding power source designed for the construction industry. 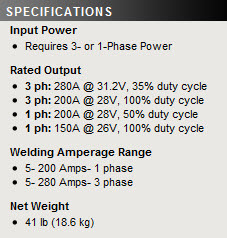 280 amps of output is ideal for stick electrodes up to 3/16 inch and TIG welding of pipe and plate. Works on single or 3-phase power, and is packaged in a durable, 40 pound aluminum case. Simple to operate with a process selector knob that automatically sets the proper Dig setting for Stick. Can be used alone or rack-mounted in 4-pack racks convenient for construction and shipyards. Inverter-based, DC power source has a SIMPLE-TO-USE OPERATOR INTERFACE providing ony the necessary controls in a compact machine. PROCESS SELECTOR KNOB automatically sets the PROPER DIG setting on E6010 & E7018 and adjusts amperage. Superior Stick arc performance even on difficult-to-run electrodes like E6010. DURABLE & PORTABLE, 40 LB aluminum case is easy to install with 208/230 V or combination 400/460 V input. Remote amperage control provided through 14-pin receptacle on front of machine. This permits use of standard amperage control devices. Fan-On-Demand™ - Internal power source cooling system that only works when needed, keeping internal components cleaner. 6 ft power cable included. Dinse style machines include male connectors. Note: Tweco-style machines do not include the male connectors.